Civil Engineer, Project Manager - Unintech Consulting Engineers, Inc.
UNINTECH is seeking a highly motivated and energetic self-starter looking for the opportunity to grow and join in the leadership team as a Civil Engineer Project Manager. He/she will be responsible for managing team members and leading the civil division through conducting studies; preparation of plans and specifications; and application of technical engineering principles, methods, and techniques on engineering projects. 0He/she must have excellent oral and written communication skills. Bachelor’s degree in Civil or Structural Engineering required; Master’s degree preferred. Minimum of 10 years of experience in civil engineering. UNINTECH offers a competitive package for all employees, including competitive salary; a complete benefit package with medical, dental, vision, life, vacation/sick leave, and a 401(k) plan with employer-match; as well as an opportunity to gain valuable project-management experience. UNINTECH is an equal-opportunity employer, committed to diversity in the work place. Please visit our website at www.unintech.com, our Facebook page, or our LinkedIn to view additional information about our company and the work we do. Please submit your resume to employment@unintech.com, or fax it to (210) 641-8279. Unintech Consulting Engineers, Inc., has been providing Civil, Structural, and Survey services across the State of Texas for over 25 years. We provide infrastructure planning, engineering, and construction services across our Divisions to both public and private clients. Our clients’ receive expertise in project designs such as water and sewer replacement; hydrologic and hydraulic analysis; urban and rural street plans and site development; TxDOT; City and County roadways and bridges; precast structures, including parking garages, structural design of buildings, supports, retaining walls, foundations, and analysis of existing structures, residential lot and slab design; as well as ROW boundaries, construction surveys, and TxDOT, Municipal, and private topographic surveys. 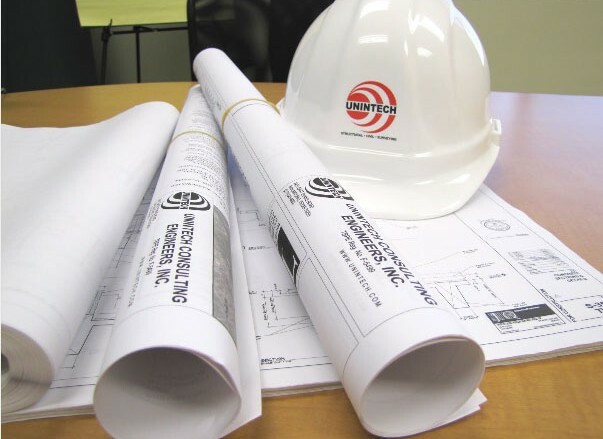 UNINTECH’s civil team is particularly qualified in the development, design, and construction management of public and private works projects that involve water and sewer main replacement, hydrologic and hydraulic analysis, open channel and storm sewer improvements, water reuse, sanitary sewer adjustment and relocation, filtration systems, floodplain reclamation, site grading, utility and drainage plans, dimensional control, urban and rural street plans, parking layout, paving plans, and traffic control.